Gold pips is taken on par with Forex pips. MyFxBook still shows Gold pips 10x of forex pips and skews the pip count. We use FxBlue and our own tools for portfolio analysis in which GOLD pips are taken on par to Forex pair pips. FSP trades all strategy + pair with equal risk by adjusting trade size to ensure each pip move equity by same value across all trades. CabEX drawdown and trading advisory is posted on CabEX thread. CabEX technical analysis has always been able to associate price action and performance – this has increased member’s understanding of the strategy's strengths and weakness. We do have a marketing team, but we ensure our marketing team always ensures members understand the gain potential in relation to the risk of drawdown. We always specify the max drawdown of the system and recommend risk level based on that. Our marketing team is also specifically instructed to include max drawdown information even if they are running a promo campaign - As a strategy developer, I understand the importance of this information. As a team, we always want to ensure members are confident about our strategies and understand the drawdown phases before they start trading. We agree that over past years we have made our share of mistake but have always been learning and improving - this is a process and hope we get to better with each day. The tests were conducted with low risk on IC Markets and Higher risk level on SMFX. 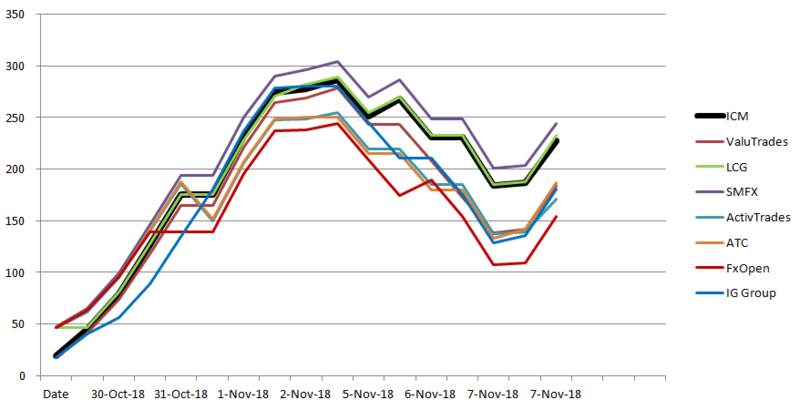 As you can see, the trading differences over a period of three month period is less than 95% and the same hold true for other 6 broker price feeds we conducted the simulated test on. Our development team will continue to work on minimizing the effects of borderline trades, but we need to keep in mind the fact that trading differences cannot be eliminated totally. 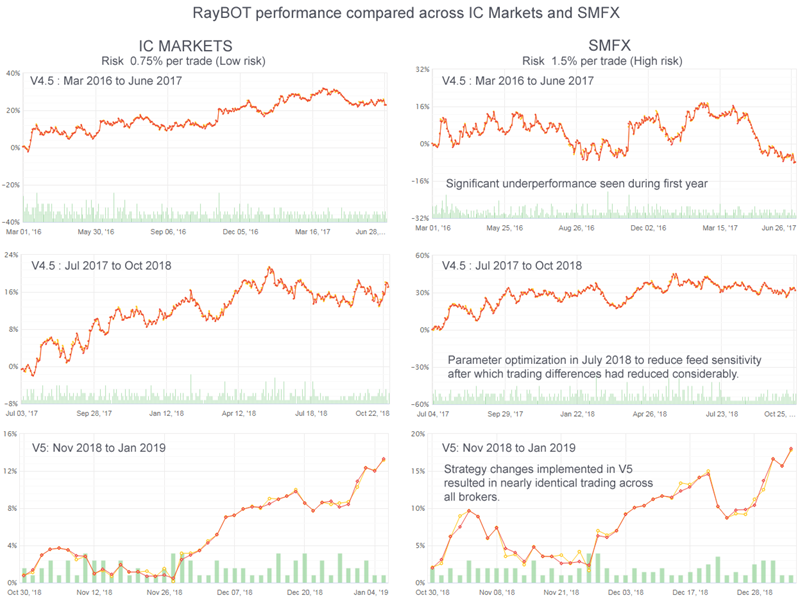 We are very confident that RayBOT V5.0 will be able to trade with 95% trade similarity across various broker price feed. 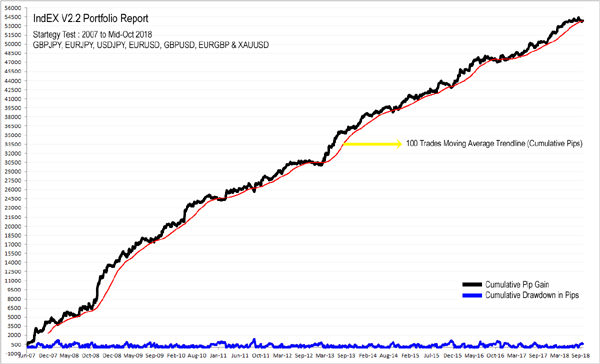 This may result in minor under/over performance of 50 to 100 pips, but in the normal course of trading this will not show significant difference in the overall gains made by the strategy which has a potential annual gain of over 1000 pips. We will continue monitoring the various broker accounts and make improvements to the strategy/logic/parameters over the next few months. ForexSignalPort is designed to eliminate any such broker related differences and ensure members accounts can replicate the performance as seen in the reference accounts. Given the past situation, give free access to signals to all licenses holders EAs? based on everything I have seen - you should just set up a pamm and have people invest if they want --- otherwise it is simply bad risk/reward for clients via subscription. The R:R is awful at 1000 pips DD to 200 average per month....you would need to be VERY patient with this one! Risk:Reward of the system can be judged from different time perspective. In this case, you have taken the monthly average gain and compared it with max drawdown. We agree this is also a valid view point and needs to be kept in mind while selecting a system. Max DD can occur anytime, but in general that would not be seen on a regular basis. It would be safe to assume we consider Max DD on a yearly timeframe. In this case, the gain potential used would also be annual (not monthly). When we consider this view, R:R at Max DD of 1000 pips to average annual gain +2400 pips may be considered reasonable. Selecting a trading strategy is based on the traders risk appetite and understanding of a strategy. Some traders are okay with floating DDs of martingales/grid systems and other some traders like the success rate of scalpers and are willing to overlook the floating loss or negative R:R.
Based on our research and experience over the years, we are of the opinions that following the golden rules of trading will ensure success in the long term. Phibase strategies have minimum R:R of 1:1 (RayBOT and iProfit). INDEX and CabEX have positive R:R of close to 1:2. Such systems typically have success rate between 40% to 60%. We do enjoy some good winning phases where it will look awesome and some phases where trading will look awful. Traders choose automated trading to enable them to trade logically as per rules. Phibase team takes every possible step to keep emotion, fear, greed and gut feeling out of its trading strategies. We try our best to base all our trading decisions, logic and rules on statistical technical facts. We will discuss the drawdown depth and recovery in another post. We had consulted with several of our members regarding this. Most preferred the EA to PAMM since each have their own preferences with regard to brokers/regulations. Members with accounts larger than $5000 see PAMM as less profitable than running EA on their own. For members with lifetime licenses we have offered FSP at a very low pricing during this pre-launch period (personalized offers made by email). We feel that drawdown of 1000 pips by itself should not be seen in isolation. The systems average gains/average loss (TP or SL levels) will need to be factored in. In case of INDEX or CabEX : Average gains are about 120 pips and average loss is about 70 pips. To lose 1000 pips the requires 15 average losing trades. To recover, it only needs 9 average winning trades. iProfit and RayBOT have DD's depths of about 600 pips - their average wins/loss is lower +30 pips/-30 pips. 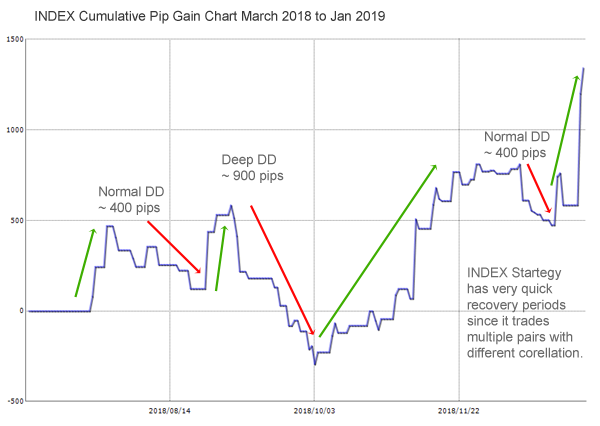 The drawdown depth and recovery periods is explained with the recent trading results of INDEX. Such drawdown recovery periods are common in trading. INDEX strategy occasional deep DD/recovery period of about 3 months. Normal DD/recoveries are of about 400 pips deep and usually of less than one month duration. We often find DD/recovery in about 100 trades as more reliable since trading activity/recover/DD depends on price action. Very dull price action periods may result in few trades which could potentially extend the duration in terms of weeks/months. The following chart plots the historical equity pip gain chart along with 100 trade moving average. This provides a good idea regarding how the equity gains can be expected in future. For INDEX, our team will use the 100 trade moving average line to monitor drawdown depths/duration - Equity going below this MA might mean deeper drawdown/moving away from historical reference. ForexSignalPort enables us to take corrective action through filtering out under performing strategies+Symbol from the INDEX EA. FSP, please be careful in your advertising, you cannot use, "Phibase Portfolio guarantees minimum gain of 200 pips per month." Only one other vendor in our forum uses a "guarantee" of 9k/ account, but he has been verified by us that Forex Manager DBA (https://donnaforex.com/index.php?topic=20305.0), has reserves to "guarantee" account up to a certain amount; do you have such a reserve set aside? looks like big progress to me, much better trade matching has been achieved. that was a huge issue in the past. and for the signal ea having all the multiple decent strategies running combined makes a lot of sense. that sure could be a great set up going forward. Could you please explain in details how the DBA guarantee works and how Donna has verified it? ForexSignalPort subscription comes with a performance guarantee assurance. This is an EA for which traders can subscribe and does not involve investment of funds like PAMM or opening an account with Phibase. If the minimum gain is not achieved, we extend the subscription period. Please let me know if I misinterpreted your advice or if I am missing something. If you read back at the posts of DBA, you will find one where Donna writes on this topic; better still, you should direct this to Donna, if I am misquoting this. The main point I am trying to make, that in the forex industry the word "guarantee", has legal implications. Thanks for the clarification, HumbleForex. We will advice our marketing team to probably consider renaming it to "performance assurance" or something like that. As per my understanding, Guarantee/Warranty is generally used for all products and is okay as long as the service is provided as per the terms specified along with the Guarantee. Edit : We stand corrected: replaced guarantee with "assurance" which better represents what we offer as per our terms with the subscription. ForexSignalPort subscription comes with a performance guarantee. This is an EA for which traders can subscribe and does not involve investment of funds like PAMM or opening an account with Phibase. If the minimum gain is not achieved, we extend the subscription period. For your protection, check with a legal expert.